Miley is sitting at a table outside Starbucks. She is sipping a cold drink and checking her phone. Laura enters, wearing black clothing and carrying a hot drink. Laura sits at Miley’s table. Miley: Hey girl! How are you? It’s been forever! I’ve been worried, you haven’t been updating anywhere! You always answer my texts! Miley: How was camping with your parents? Was it good bonding time? Miley: I thought you were only going to be gone a week! What happened? Laura: Ugh. I never got along with my parents. They were always telling me about how I should live life to the fullest and experience the joys of nature and eat good real food and my dad told me that being out in the wild would give you a real perspective on how fast and pointless modern day life when. Then my parents got eaten by bears. Laura: Yeah. They got eaten by bears. I refused to sleep outside in the tent because I was afraid of getting eaten by bears. Then they got eaten by bears. Laura: Yeah, so I’ve been dealing with like funeral and executing their wills and with relatives and it’s been exhausting. I finally got back into town last night. That’s when I texted you. Laura: Whatever, I never got along with my parents. Miley: What are you going to do now? Miley: They were rich right? They left you money? Laura: Like $15,000 a year. Miley: What! That’s not enough for a cool apartment in the city! That’s not even enough for Starbucks! Laura: I know. But it turns out all that time exploring the great outdoors meant that they were just constantly getting themselves into debt. All those jetskis and ski-skis cost a lot of money they didn’t have. Plus my student loans. Paying all that off is why I only have $15,000 a year. Miley: So seriously, Laura, you need to get a job or something. Laura: I’ve been trying! I send out ten resumes a day! No calls! No one believes me! Not even Starbucks calls me. I’m a regular! They owe me. Miley: Well you can’t just do nothing, that’s like below the poverty line. Laura: I am going to do nothing, but I’ve got a plan. I’m going to live with relatives. Laura: During the eulogy I played up the boo-hoo me, all alone in the world. So I got a bunch of emails from relatives saying that I could live with them. I need you to help me go through them and figure out which relative I’m going to live with. Miley: You’re just going to mooch off them? That’s not cool. Laura: Obviously not. I’m going to say that I’m writing a novel. And maybe I will! I’m good with words. This is perfect. I’ve got feelings, right? My parents died. So I’ve got feelings, and an English degree, and lots of free time. I should totally write a novel. No one can complain. I’m working. I’m writing. All I need is a safe place to live and eat while I write. Come on, Miley. Help me decide who is going to be my muse. Laura: That’s my Miley. Come on. She pulls out a cell phone or tablet or something. Welbeth pushed the bicycle up the rocky mountain path. She had always known that mountains were tall, but did they have to be this tall? Her feet ached in her shoes. They felt broken and rubbed against her socks. Her bloomers and shirt clung to her wet skin. Her mouth and throat ached for water. The sky was blue above her, an achey, empty blue. What a stupid story, she thought. She heard the scraping and the rumbling; it came from far off, farther than from her fashionable rubber tires rubbing against the rocks. It raised its head, triangular and orange against the shimmering blue sky. Its eyes stuck out on the side of its head. Only one could face Welbeth at a time, and only one faced Welbeth now. It narrowed that eye, and narrowed its pupil. Welbeth froze in its gaze. Her eyes followed down the dragon’s neck. Down. Down. Down. Down. Its body was wrapped up in its wings. Two oddly human-like hands were folded in front of a rather flat chest. A long tail wrapped around its body. It looked rather comfy like that, actually. Long tail and folded hands. The dragon regarded her lazily. “N O,” rumbled the dragon. “N O T A S M U C H A S B E F O R E,” the dragon said. Welbeth could have sworn it was smiling. “I S E E,” said the dragon. “I A M C A L L E D S C A L Y B Y S O M E,” said the dragon. “But not all?” asked Welbeth. “C L E A R L Y,” said the dragon. “Y O U C A N N O T C O M P R E H E N D T H E V A S T N E S S O F T H E D R A G O N T O N G U E,” said the dragon. “Are your meals that intelligent though?” asked Welbeth. That didn’t make Welbeth feel any better. She started pushing her bike along again. She had a lot of thinking to do. Even just the idea of getting cats has made me more focused. I’ve paid all my bills and cleaned the bathrooms since I’ve decided that I want to get cats. I’ve even picked out what cats and I want and have contacted their fosters. The only thing stopping me now is that I don’t have a Yes or a No from James. Ever since I read Jonathan Strange and Mr. Norrell I’ve wanted an orange cat named Jonathan and a grey (or black) cat named Mr. Norrell. So I went and found cats that looked like that. Dude… I am so handsome I just can’t STAND it. Don’t you agree? But these good looks didn’t come easy, you see. My foster mom can explain all that to you, but for now, let’s concentrate on ME. I love to play. My favorite toy is a spring. Oh, and zip ties! Next is my love of Temptations cat treats. Seriously…. they are better than sliced bread. I love to cuddle with my foster mom at night, and maybe get some wrestling in, too. She is such a great play partner. She said something the other day about me maybe not being the best for a home with small kids because I like to play hard sometimes. Wrestling is the BEST! Mom says I have excellent litter manners. And I only sharpen my claws on my cardboard mat. …So have you decided you want to meet me yet? That’s what I THOUGHT you said! Send an email to the shelter to connect with my foster mom so we can hook up and chill. Cuz I’m already neutered, chipped, up to date on my vaccines, and ready to roll! See you soon! So obviously I contacted the foster with more questions about his health. Apparently when they found him (as a stray), he was underweight and had some sort of fungal infection. They have since cleared it up, and his hair has regrown (and he’s gained weight). His ears are still hairless though. But he is just the most handsome, personable guy, and I’m so glad we could get him all fixed up so he could show that personality to others. If you’d like more info, let me know! I’d love to hear about you and the home you’d provide if you are interested in him. And thanks so much for your inquiry! I responded back two days ago, but I haven’t heard anything since. I’m not sure what to think. Maybe she didn’t like my description of our house? Maybe it was sent to a work email and she’ll reply on Monday? I don’t know. I’m not going to stress, because, again, James hasn’t agreed to this. Although we’ve talked several times. 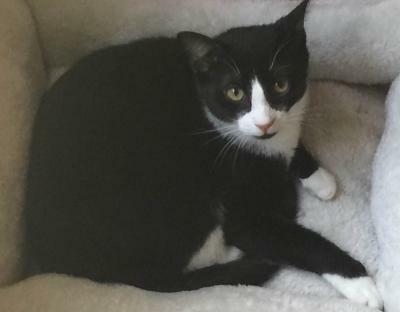 Boris is a very beautiful black and white cat, who is also very timid. His desire is to hide but he has been coming out more and more, to play with the other cats. I’m trying now to spend more time just petting him, so as to not overwhelm him. I would suggest Boris be in a house with another cat. He’s still fearful of people but seems to enjoy having other cats around. He does ok with my dogs, but they are laid back and don’t really have any interest. Boris needs a family willing to give him time to learn to trust. Are you the right family to help him? It took two days for the foster mom to respond to my email. I believe Boris came into WCAC as a stray. I’ve had him in foster since March. Initially, he was so scared, he would just pancake to the floor in fear. Over time, he now seeks out attention. Loves to be petted and rubbed but still does not like to be picked up. He loves other cats and dogs but will run from sudden movement or strangers. He has come a long way and really wants my attention. I do think he needs to be in an adult/older teen home. 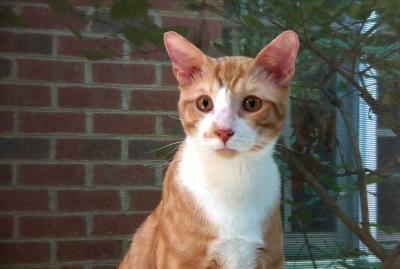 He loves to be petted and will play with you but can be a little rough in play. Working on that. No health issues. current on shots, neutered, and microchipped. I responded a few minutes ago with a description of the townhouse. So…? I don’t know. I can’t help but feel like if I have two cats who play rough, one gregarious, one shy, then best friends will happen. As long as I introduce them slowly. Oh, I hope James makes up his mind soon. I received an email this morning saying that Wake County Animal Center is having a cat sale. Cats are normally $45 and $20, but for this weekend only, they’re $25 and $10. Heck, they started out cheap. I could get two cats for $20! Which is what I would want. Cats do best in pairs. And we have a cat-sized house. Two levels, lots of walking space. We welcome up to 2 pets per apartment home. The pet fee is $300 for one pet and $400 for two pets. There is a $15 per month pet rent for 1 or 2 pets. Breed restrictions apply, no weight limit. I’ll be honest: that is incredibly reasonable. I can cover that no problem. James doesn’t particularly like cats. He doesn’t particularly dislike cats either. He just prefers dogs. Fuzzy pets are therapeutic. Their affection is calming; engaging them mentally with play and the like is stimulating. They’re supposed to be really good for people with emotional disorders, like depression. I’ve been thinking more and more that having an emotional support animal like that would be nice. I’ve been feeling it in my chest again for the last few days. Even if I convinced James to let us get cats (or a dog, dogs are $95), I can’t just impulsively do it. What are the things I need? …so we’re looking at $200+ for cat(s) + basic cat supplies, minimum, before we even get into vet fees. …so we’re looking at $270+ for dog + basic dog supplies, minimum, before we even get into vet fees. Cats are more affordable, but at this point I’m looking at throwing down $600+ on these cats before we even get into the fun stuff (toys) and vet stuff. And like, I want to say I’m willing to do it, but there is the wedding to think of. There is the fact that James wouldn’t really be on board with this. I’m not sure I’m willing to spend $600 like that all at once. As much as I want a fuzzy, as much as I would benefit from a fuzzy…I can’t do it. Home Depot will take anyone that is willing to smile and ask follow-up questions. They can tell you what the right follow-up questions are. They can teach you the keywords to listen for in the customer’s response. They can tell you to put a smile on your face. But they can’t tell you how to get that smile on your face. No, that has to come from you. So people who work at Home Depot are pretty friendly, chatty folks. Everyone is always happy to see you. It takes some getting used to when you find out just how friendly everyone is. When people you don’t know greet you by name and ask how you’ve been, stopping and chatting with you, it’s weird the first time. After a while you just roll with it. There’s a lot less griping amongst Home Depot employees, from what I can tell. Sure, we all have Stupid Customer stories and complaints about idiotic policies from Corporate — but none of us really complain about our jobs. This is a consistent rule of thumb for everyone except the people in Lumber. Now that is really only true at the Durham store where I work currently. At the Fairfax City store, all the Lumber people were hard-working and friendly, if annoyed at the chronic understaffing of their department. But at Durham, that’s where they stick the young, able-bodied men for whom this is a first job or nearly a first job. They’re here to pick things up and put them down, and they know it, and disappear for hours at a time. Admittedly it’s usually hard to track down people working in Plumbing or Electrical as well. Electrical is understaffed, and all the Plumbing associates are either running trucks in other parts of the store or hiding in the breakroom, ignoring their phones and resenting us for being young and energetic. But once you have them, they give you great service. And admittedly there are folks in lumber who are full of the Home Depot energy, but Khiry is usually working trucks in another part of the store too. About two weeks ago I was wandering around in Lumber. It was slow at Flooring, so I was looking for wood for my dollhouse. I suppose I could have been doing something more productive, but I was excited about this new project. A woman approached me, carrying a large stack of Composition notebooks. She had heard from a fellow teacher that we could cut these notebooks in half, thereby halving the amount of money she had to spend on notebooks for her kindergarteners. I did the only thing I could do, and did a general page for someone in lumber to meet us at the saw. I kept the customer occupied by asking questions about preparing for the school year until someone finally showed up. It was a guy I hadn’t really met, although I had seen him around. He’s ageless, but not in a good way; he could be an ugly 20 or a young 40. No matter what time of day it is, he always seems covered in a layer of dirt. I feel like I’m being unnecessarily cruel. Something about him seems off, is my point. He announced his presence by stepping in the middle of the two of us. He smiled at me. “What do you need?” he asked. I gestured at the customer and said that she wanted notebooks cut in half, and she had heard that we could do it. He was still smiling at me. “We don’t cut notebooks,” he said. He still hadn’t looked at the customer. The customer began rattling off all the teachers she had heard who swore up and down that they had had notebooks cut at Home Depot, that it even said on the internet, and if they were cut in half she could use one half for math and one half for writing practice. Meanwhile, he was still looking at me. I gestured at the customer again and said that surely we could try it. What could it hurt? The conversation continued for a few minutes; he barely glanced at the customer except to look at the notebooks. He directed all his comments at me. I gestured frequently to the customer, trying to get him to look that way. The cuts went perfectly. There wasn’t even slivers around the edges. The customer left, satisfied. As soon as she was gone, the lumber associate rounded to me, smiling. All I could think of was getting back to Flooring, to where my job was, away from him. He started telling me why he wasn’t in lumber when I made the initial page. I started walking towards the middle aisle. He sauntered along next to me. I was walking quickly, but he’s tall enough that a saunter could match my brisk pace. He asked me how I like Home Depot and Flooring and I gave neutral answers. When we got to the aisle I prayed silently that he wasn’t going to walk me all the way back to Flooring. Instead, he gave me a formal good-bye and walked away. I mentioned the whole conversation to James. He said that I should report it to management. I said that he technically hadn’t done anything wrong. He was just sort of creepy. Today I was working in the Blinds aisle, which for some reason is in the Flooring department. I was pulling boxes down from the overhead and filling up shelves with blinds. The Blinds aisle is right next to the breakroom, and as this lumber associate was leaving the breakroom, he saw me and started walking up the Blinds aisle. He said hi and I said hi. He asked how I was and I said fine, how are you? He forced the conversation to continue, asking me about my night and how late I was working. Lots of people exit the breakroom and walk through the Blinds aisle. They also greeted me and asked how I was doing. But none of them stayed. Those conversations were conducted in Doppler. This conversation was a radio tower. I turned my back on him and worked. I kept my answers neutral and as brief as possible. I didn’t want to have a conversation with him. I hate the way he looks at me. I thought, get the hint and walk away. Get the hint and walk away. Finally he left to go back to work. On one of my days off last week, I visited Lowes to pick up dollhouse supplies (because I am shameless and would rather drive five minutes than twenty-five just for brand loyalty’s sake). Since it’s hot down here, I was wearing a short sundress. I had recently showered, so my hair was at its curliest. I had shaved my legs and armpits that morning. And I was wearing makeup. In short, I was as cute as I could be. And I was walking around the lumber aisles of Lowes. Lots of guys did double-takes. I mentioned this to James that evening.